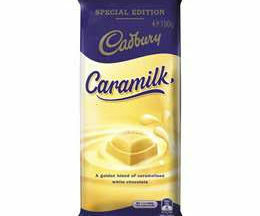 Cadbury has recalled its popular Caramilk chocolate after small pieces of plastic were found in some blocks. Caramilk is a recent flavour return for Cadbury with some searching supermarkets for the caramelised white chocolate last sold in Australia over 20 years ago. Cadbury has recalled Caramilk 190g blocks with best before dates 0f 17/01/2019 and 21/01/2019. The decision to recall came after a limited number of Caramilk blocks were found with small flexible pieces of plastic because of a fault in the manufacturing process. “Our analysis of samples received to date has determined that this product does not appear to pose a serious health or food safety risk, but a recall has been initiated to prevent the risk of minor injury,” Cadbury said in its recall notice. Some consumers have taken to Cadbury’s Facebook page saying they are willing to take the risk of eating the chocolate as fans of the limited-edition flavour. Consumers can return affected blocks to their place of purchase for a full refund. No proof of purchase is required for the refund. The CSIRO is conducting a survey to gauge the impact Australian diets have on the environment. The French government has banned food service providers from offering free soft drink refills.